"I have trained bees to do several things, such as collect sugar from fruits, instead of using flowers"
It's Cannabis? It's Honey? No, it's CannaHoney! CannaHoney. A quick google search shows this is not a new idea as there are many links of people trying to infuse cannabis into honey, but nobody does it like this guy does! Nicolas is an artisan, a locksmith & a beekeeper, along with being an all around nature lover and a strong advocate for medical marijuana. He has been beekeeping for over 20 years. Since 2006 he has been studying how to train bees to make honey from cannabis and in 2013 he saw his first success... CANNAHONEY! He currently has 30 hives and works with his wife in France, though he is aiming to continue his work in Spain where laws are less restrictive and where it is easier to find professionals to study his work and properly analyze the properties of this new creation. Consider the potentially potent health benefits of combining these two exceptional gifts from Mother Nature. 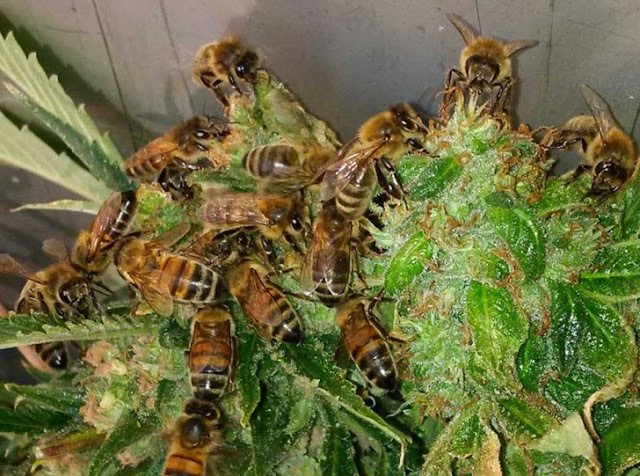 As far as he can tell at this point, this honey has the same effects as cannabis with thc & cbd's and also has a nice floral flavor which varies depending which strain of cannabis they are working with at the time. Nicolas doesn't have a website but if you would like to connect with him you can do so throughhis facebook.